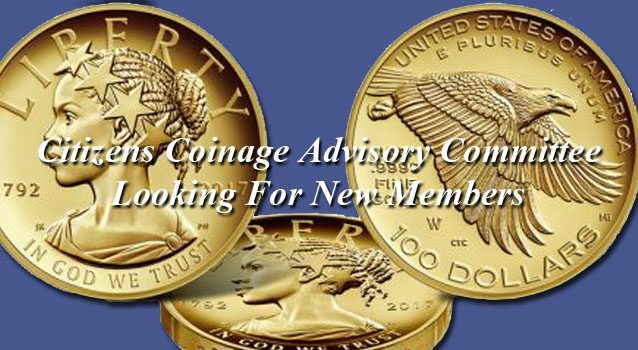 The Citizens Coinage Advisory Committee (CCAC) is currently accepting applications for new members. The CCAC was created in 2003 by Congress under Public Law 108-15. Its role is to advise the Secretary of the Treasury on the themes and designs of all U.S. coins and medals. The CCAC specifically advises the Secretary of the Treasury on any theme or design proposals relating to circulating coinage, bullion coinage, Congressional Gold Medals, and national and other medals produced by the United States Mint. The CCAC also advises the Secretary of the Treasury with regard to the events, persons, or places that the CCAC recommends to be commemorated by the issuance of commemorative coins in each of the five calendar years succeeding the year in which a commemorative coin designation is made. The CCAC is comprised of 11 voting members appointed by the Secretary of the Treasury. Each member serves a four-year term. To achieve diversity, some members must possess special skills or backgrounds, including specialization in sculpture or medallic arts; numismatics; American history; and numismatic curation. The U.S. Mint is currently looking for CCAC members specially qualified by virtue of their experience in the medallic arts or sculpture. Candidates must also have demonstrated interest and a commitment to actively participate in meetings and activities, and a demonstrated understanding of the role of the CCAC and the obligations of a Special Government Employee; possess demonstrated leadership skills in their fields of expertise or discipline; possess a demonstrated desire for public service and have a history of honorable professional and personal conduct, as well as successful standing in their communities; and who are free of professional, political, or financial interests that could negatively affect their ability to provide impartial advice.